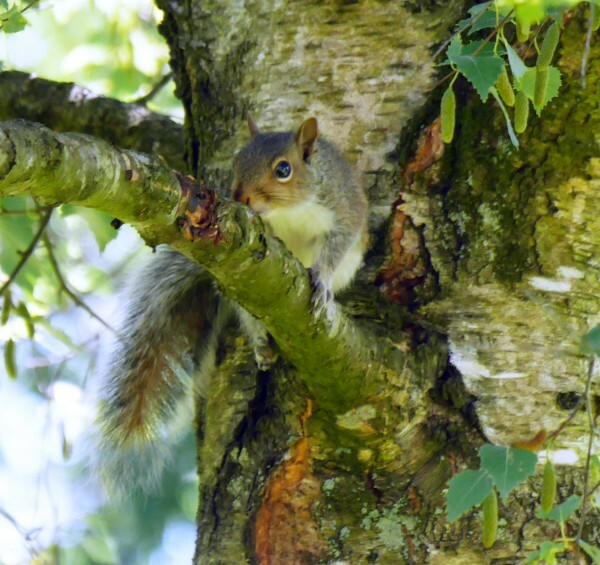 Once upon a time, we only had to worry about the impact of the imported grey squirrel on our native red squirrel (see blog https://www.woodlands.co.uk/blog/conservation/red-squirrel-grey-squirrel/ ). However, it now seems there is another player on the scene: the black squirrel. Whereas red and grey squirrels are two distinct species, Sciurus vulgaris and Sciurus caroliniensis, black squirrels are variants of the grey squirrel. The difference between the two is largely due to a change in the gene (a specific sequence of nitrogenous bases in the DNA of the chromosomes) that affect the production of melanin pigments (in the hair and skin). The black squirrel has “lost” a piece of DNA associated with these genes. As with most genes, the melanin genes occur in pairs. If the squirrel has one damaged gene, then the animal has brown-black fur. If, however, it has two copies of the damaged genes then it has a glossy, jet- black coat. Some of the first sightings of black squirrels date back to the early 1900’s, but in recent years they have become more common in parts of Hertfordshire and Cambridgeshire. It has been suggested that the black form has higher levels of the male hormone, testosterone, and is, therefore, more aggressive in seeking a mate and establishing territory. The black form of the squirrel is known in Canada and parts of the United States. You want to see squirrels! The greater Toronto area (GTA) has numerous squirrels. Parliament buildings and surrounding grounds are patrolled by the resident falcon to control them. They do provide an irresistible subject to photograph for the Japanese tourist and others. My neighbourhood 20 miles west has numerous brown, grey and many black squirrels. Over four years of observing them I can unequivocally say the black squirrels are the more aggressive or at the least the cheekiest. They do not hesitate to come right up to the back door or patio table whereas the grey ones keep their distance. They also chase the the gray and brown squirills away although occasionally can be seen getting very cosy with each other. They are thriving here in Portugal. They are a Black Red hybrid and they are everywhere. It leads me to believe from the comments that they may be inter species as they are definitely red crosses her; however if they can do that then they could cross with greys. As per Mike, Ian and Rodger, I too came across this page after two viewings and not being sure what I was seeing ! We live in Chaos, very close to Alvaiazere and this is the first time in 7 years I have seen them. I live in southern Louisiana and these jet black squirrels are beginning to run rampant! I am also confused by some of the information above because our blacks are in fact much more hesitant and more calm than the usual greys I have grown up with, even had as a pet! Our hunters shoot to kill all during squirrel season but prefer greys due to blacks being a much grainier/tougher meat. (I can not eat them, I believe they are a mere step up from eating a rat (which here in Louisiana is done due to the overpopulation of nutria) Amazed I can’t find more localized information on this topic. As per Mike and Rodger, I too came across this page after viewing one. We have just got back from our house in Vendas, Nr Alvaiazere, Central Portugal. I heard aloud rustling in our pines and eucalyptus and there it was this strange kind of black, red, white bibbed pointy eared squirrel or whatever. It looks like they’re breeding rapidly in Central Portugal if your only a couple of villages away in Almoster, or is it a not a squirrel?? As Mike above says, I too came to this page to see if the black existed. I had seen a very feisty, chatty, aggressively behaved one in the pines as I was having the land fenced and some pines cut in the forest surrounding me 2 years ago. We were obviously disturbing its habitat. Noone believed there were black squirrels. My girlfriend now believes me as, as she was leaving the property today she disturbed one in the road next to the casa. I had thrown the soil and roots of potted cabbages into a deep rut in the road. It was obviously interested in it as a source of food. Oddly it did not run up the pine next to it but up the road and into the undergrowth. I live near Almoster in central Portugal. The ‘spread’ of the grey squirrel.